Released towards the end of last year, NIGHTLIFE, lifts the lid – or in Eddie Manion’s case, his signature Fedora – on a collection of tracks that have been arranged as individually as the DNA he carries, reflecting the deep passion he not only feels about playing his saxophones but also the memories the individual pieces of music have evoked in him over the years. The album title suggests you might want to listen to it set against a background of the moon, the stars and a glass of something that works well mixed with ice cubes making clinking noises against the side of crystal… and I am absolutely sure that would work. But honestly, I’ve been giving NIGHTLIFE a bit of my own test-drive, so to speak, and can tell you it also works when you’re driving on the autobahn or lying in a bath-tub full of bubbles on a lazy Sunday morning or even spending quality time with your favourite people. It’s got… play-it-again-Sam moments. It’s got… Don Draper moments. It’s jazzy, classy and bluesy. It’s got soul. It’s even got… go-straight-to-the-Jersey-Shore-do-not-pass-GO-do-not-collect-$200 moments… and maybe the aspect that I felt most, it’s like going back to those days when listening to music meant having an A-side and a B-side to choose from. The reason I say that is because tracks 6 and 12 really hit the spot with me. From the moment I pressed “play” on track one, I felt like I was on a musical journey… Town Without Pity, Tenderly, Amazing Grace, A Change Is Gonna Come and Smoke Gets In Your Eyes all carrying their own genres and reasons for being selected by Eddie. And then, boooof… out of nowhere, Bruce Springsteen’s, City Of Night – Soul Serenade, a fabulous, seldom performed classic but, you never know… maybe after hearing Eddie’s arrangement of this, we’ll be seeing it on the song requests that have become a tradition with the pit audiences at Bruce’s concerts during the last few tours! The “second half“ of NIGHTLIFE, is your VIP/AAA ticket to Ronnie Scott’s or the Blue Note or to wherever your fav jazz/blues hang-out happens to be. It’s Gonna Take a Miracle, Stardust, Bolo Blues and Nightlife are presented like they were meant to follow each other on a set-list, providing the perfect backing to your candle-lit dinner, right down to the rumba-esque, Manha De Carnaval where your dinner-date asks you to dance. And then, all too soon, The Only One, appearing on Roy Orbison’s posthumously released, Mystery Girl, like it was the finale, the last song of the evening… the one you carry around in your head for days, humming the melody as you go. I guess that’s basically where NIGHTLIFE has taken me and my imagination, thus far. So yes, when I heard that Eddie was hosting a launch party to mark the release of NIGHTLIFE in England, I jumped (well, flew actually) at the chance of being there. “There“ being The Hind Hotel, a Grade II listed building and former coaching inn, saturated in English history as far back as the 1600s and situated in the heart of Wellingborough, a traditional market town that nestles in the county of Northamptonshire. The hotel manager, Ian Hamilton, self-confessed Jersey Shore music fan, couldn’t have made us feel any more welcome ala his Born To Run, 40th Anniversary, limited edition poster that decorates the hotel bar! The date (Monday 7th December 2015) was sandwiched between a couple of the 2015 Light of Day European Tour shows in which, Eddie presented some of the material from NIGHTLIFE, sharing the stage with fellow LOD troubadours, Joe D’Urso, Rob Dye, Vini Lopez, Jake Clemons and the Hooters frontman, Eric Bazilian. Of course, being so close to Christmas, there was a definite Holiday Season flavour to Eddie’s record release party – decorated trees, Christmas songs blended in with the album tracks and of course, there was spirit – not just the kind that carries a proof rating but more as in, kindred… like the people there were somehow related through the music. Accompanying Eddie for the launch, was a rather excellent local jazz trio led by pianist supremo, Lincoln Noel, who wore the grooviest, coolest socks I have seen in a while – think: ebony and ivory piano keys and you’ll get the drift! 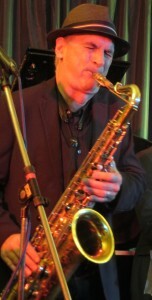 Ably assisting Lincoln were Ben Markland who did a stellar job on upright bass and completing the outfit, Andy Gemmell who so generously shared his drum kit with Vini Lopez during the course of the evening. Additional special guests sharing the stage with Eddie were: Rob Dye, Miss Emily, Jake Clemons and Joe D’Urso. Eddie’s skills as an accomplished producer, arranger and saxophonist are crystal clear on NIGHTLIFE… I mean, some guys I know teach their guitars how to “talk”. But give this album a listen and you’ll hear that Eddie’s saxophones can “talk” too in their own raspy, sensual, sophisticated, articulate and… downright sax-y way… all the way through. On a personal note, I’d like to say thank you for giving us NIGHTLIFE, Eddie and for allowing us to share some of the sounds that carry a special meaning for you. Also for the wonderful photographs you shared from your personal collection showing yet another side of your artistic qualities. And by the way, if anyone is asking? From that collection on the gantry on the CD cover, mine’s a Drambuie, on the rocks, please. 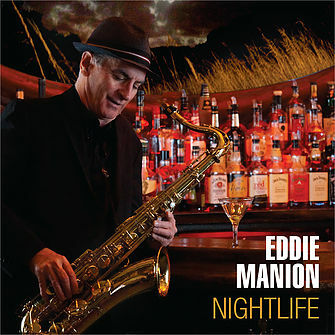 You can order a signed or unsigned copy of NIGHTLIFE now online from www.eddiemanion.com that includes a 12-page, full colour booklet of Eddie’s personal choices of photographs he took while out on tour in different parts of the world.